I’m old enough to remember when everyone didn’t carry a powerful computer and advanced digital radio transceiver in their pockets. Back then, long-distance wireless communications still seemed exotic and well aligned with my love of electronics, so I got an amateur radio license (N3XWK). While I have done lots of commercial work with wireless communications, I have sadly done very little in the amateur space. It is a Chinese brand that has received a lot of attention and generally good reviews and I can see why. The transceiver is as well built as any Icom or Yaesu I’ve had and costs $30-$35. 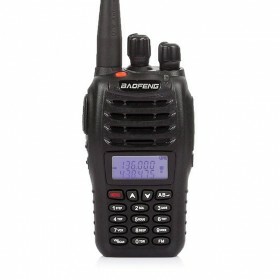 It feels rugged and good in your hand and has every feature you could want (offsets, CTCSS, DTMF, 5kHz steps, narrow/wide band channels, 99 named memories, LiIon battery and charging base, etc.). It is an incredible value, highly recommended.